Description: Cost is $30 which will include Shot Glass Cannons, Meals and Drinks. Please make your reservations with the Secretary at 619-295-4420 or by email at Hackett@lodge.sdcoxmail.com. Any questions about the event, please contact Wor. Steve Laurvick by email at slaurvick@gmail.com. All lodge officers are also encouraged to attend this event and opened to all Masons. Description: "Host" Lodge provides refreshments for ~50 and "Work" Lodge demonstrates the ritual work for the evening. Host - East San Diego# 561 and Work - San Diego# 35. 2° Degree, Opening, 1st and 2nd sections. Description: Masonic education presented by Bro. Devin Briese and Wor. Achenbauch who will discuss the Circumpunct or the Circle and the Dot. The symbol of the circle with a dot at its center is one of the oldest symbols on the planet. At different times throughout history, it has symbolized various ideas, concepts and realities. It also is part of modern Masonic symbolism and most recently featured prominently in “The Lost Symbol” by Dan Brown. This month’s Esoteric Masonry session will focus on this symbol and some of its history. And then, in keeping with our focus on personal practice, and tools for transformation, we will learn a specific concentration practice that one can do with this symbol that has the potential to bring the practitioner further into Light. 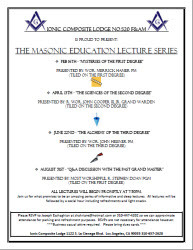 This session is open to all Mason’s as well as those interested in Masonry. Please arrive a few minutes early so that we can start on time. Description: Annual Master and Wardens Retreats offer a team-based workshop approach to planning for each lodge's future. They are open to all lodge masters, wardens, and junior wardens; lodge leaders are encouraged to attend as a team. Online registration will be available soon. Questions? Contact Kim Hegg, program services manager, at 415/292-9111. Description: Mandatory meeting for all lodge officers who are part of the 909th Masonic District and the 921st Masonic District. If you are unable to attend this event, please contact your district inspector - Wor. David H. Haslim (921st District) or Wor. John R. Heisner (909th District). Description: Grand Lodge of California will be hosting its annual communication in San Francisco. For details, please contact Kim Hegg @ programservices@freemason.org.